A young soldier Evgeny had been captured by the Chechnens along with five of his buddies. The Chechnens promised to spare the young Russians their lives if they converted to Islam. The others agreed, but Evgeny refused, insisting that he was an Orthodox Christian. The Chechnens beheaded him and subsequently sent his severed head to his mother as a sort of memento. 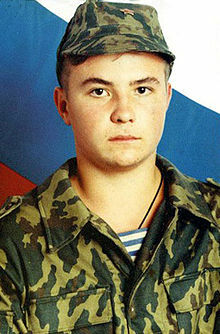 Chechnen field commander Rusland Haihoroev beheaded Evgeny, after Evgeny denied conversion to Islam and refused to give up his cross (which by the way was part of the medal for bravery). Many months his mother searched for his body, and finally after paying $500, was shown the forest where he was buried. She found the bodies of 4 more boys along with his. A giant wooden cross has since been erected on his grave. His own cross, the one that he refused to give up, his mother, Lubov Radionova, has donated to St. Nicholas Church in Ordinka, Moscow. Thy martyr, Yevgeny, O Lord, in his sufferings hath received an incorruptible crown from Thee, our God, for having Thy strength he hath brought down his torturers, hath defeated the powerless insolence of demons. Through his prayers, save our souls. Orthodox Heritage. The Greek Orthodox Brotherhood of St. Poimen. Florence, Arizona. Volume 01, Issue 1 January 2003 p. 4.